Inspired by the HandyShopper concept, this App truly simplifies and enhances your shopping experience. Easy to use (even with one hand), yet very powerful and flexible: One tap - marked as needed, another tap - marked as have, checkout when finished. 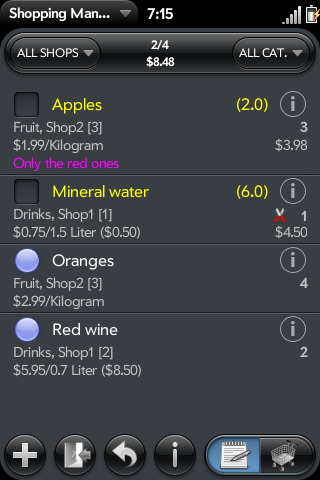 You can set name, quantity, standard quantity, unit, price, aisle, notes, tax, priority, coupon, planned date, auto-delete and image for each item.